University of Florida researchers have discovered a 10-million-year-old Neotropical nursery area for the extinct megalodon shark in Panama, providing fossil evidence the fish used these areas to protect their young for millions of years. Appearing in the journal PLoS ONE, the article is the first thorough study of megalodon juveniles and gives scientists a better picture of shark behavior. Previously suggested fossil shark paleo-nursery areas, the Paleocene Williamsburg Formation and late Oligocene Chandler Bridge Formation of South Carolina, were based only on the anecdotal presence of juvenile teeth accompanied by marine mammals. “Neither of the collections from previously suggested nursery grounds has been as rigorously analyzed as the specimens in this study, which better supports the presence of this paleo-nursery area,” Pimiento said. In the current study, funded by the National Science Foundation, researchers collected 400 fossil shark teeth between 2007 and 2009 from the shallow marine Gatun Formation, which connected the Pacific Ocean and the Caribbean Sea during the late Miocene Epoch in Panama. Most of the 28 Carcharocles megalodon specimens were surprisingly small, Pimiento said, and analysis determined the size did not relate to tooth position in the jaw or the size of the species during the late Miocene. “Our study suggests the specimens represent mostly juveniles with lengths between 2 and 10.5 meters,” Pimiento said. Michael Gottfried, associate professor and curator of vertebrate paleontology at Michigan State University Museum, helped review the PLoS ONE article. His method of determining the skeletal anatomy of megalodon sharks based on comparisons with the great white shark was used in this study. Though Gottfried said he did not completely agree with all of the study’s conclusions, he believes the findings are interesting. Nursery areas for sharks have ample food resources and serve as protection for juveniles and neonates from predators. Some scientists argue megalodon did not need nursery areas to protect their young because it was the largest shark that ever lived. But researchers discovered teeth in the study area from juvenile megalodon sharks as small as 2 meters long. Other studies also have confirmed present-day large sharks such as the tiger shark, great hammerhead and the white shark use nursery areas. Other studies have shown white sharks, which belong to the same order as megalodon, seasonally return to the eastern Pacific and other coastal “hot spots” for feeding, foraging and mating. UF researchers considered the hypothesis that megalodon sharks used the grounds for feeding and reproduction rather than as a protective nursery area, but rejected the possibility based on the high number of juveniles, presence of neonates, shallow depth of the area and the scarcity of large mammals. 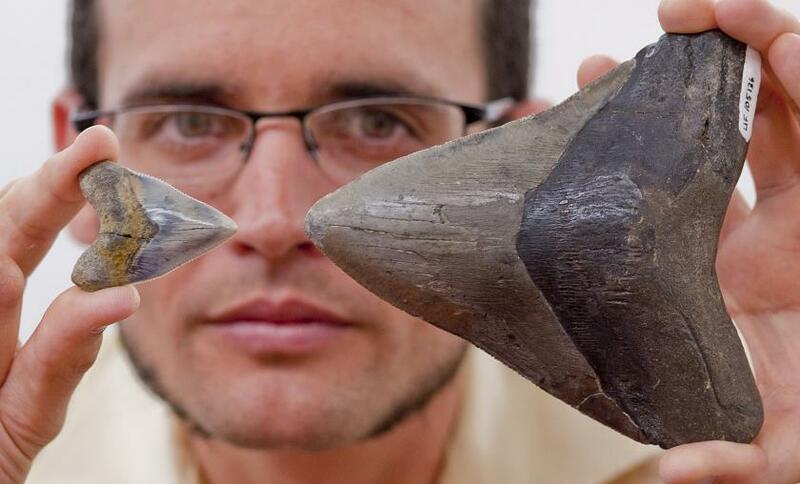 “This study of the megalodon teeth from Panama and its paleobiologic implications demonstrates the potential information that other fossil shark faunas can give us, including survival strategies, feeding habits and life histories,” said Dana Ehret, second author and vertebrate paleontology graduate student at the Florida Museum. Other authors are Bruce MacFadden, Florida Museum of Natural History vertebrate paleontology curator, and Gordon Hubbell of Jaws International. Most of the teeth collected are located in the Florida Museum of Natural History, which also houses the Florida Program for Shark Research and the International Shark Attack File.